Title: New Map of the States of Georgia South and North Carolina Virginia and Maryland Including the Spanish Province of West and East Florida From the latest Surveys. Published in New York, 1793. 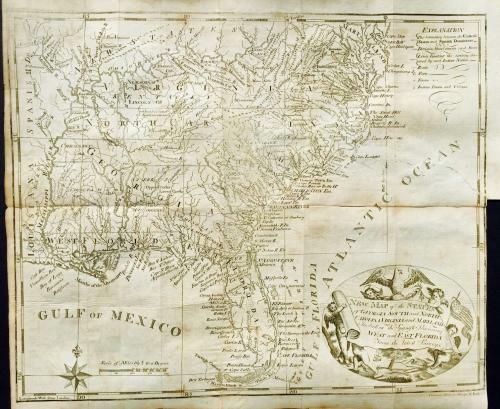 A very rare map of the Southeastern United States, which appeared in Imlay’s “A Topographical Description Western Territory of North America”. The map shows Georgia, Virginia, and North Carolina extending to the Mississippi River. A large amount of fascinating historical detail is included: early forts are noted along the Mississippi, the position of a number early western counties are identified in Western Virginia (e.g. Lincoln, Neilson, Jeferson [sic. ], Fayette, Mercer, Maddison [sic. ], Bourbon, etc.). A great many Native American ‘towns and villages’ are located, and the boundaries between the territories claimed by the various tribes are also indicated, as are the Boundaries between the U.S. and the Spanish Territories. The Cumberland Settlements are noted; many early roads are shown; there is excellent detail throughout East and West Florida. Old folds; some toning (see images); repaired tear from the right margin extending into North Carolina, slight surface damage with some associated neat facsimile work, occasional fold splits, all repaired on verso (see images). Ref: Wheat & Brun 495.